Thanks to the government’s comprehensive revision. This column went up at PJ Media and was teased here at BizzyBlog on Thursday. Rather than allow the establishment press to be the nation’s lone voice on the U.S. economy — predictably chortling that it “has rebounded with vigor” after one supposedly good quarter showing 4 percent annualized growth — let’s take a look at what else the government’s Gross Domestic Product data released Wednesday revealed. 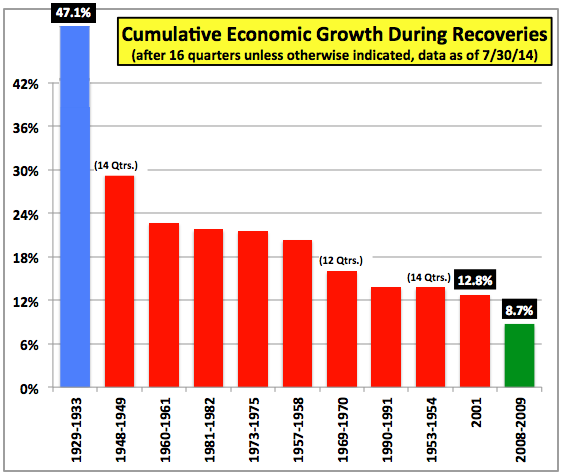 In addition to disclosing that the first quarter’s contraction, at an annualized 2.1 percent, was not quite as awful as once thought, the Bureau of Economic Analysis’s comprehensive revisions to previously published annual and quarterly GDP data reconfirmed that the economy during the first four years of the Obama “recovery” underperformed every post-downturn economy since the Great Depression by a wide margin. Most people know that, or should — and if you don’t, here’s the proof. Beyond that, BEA data now show that Obama’s post-recession economy put in a performance worse than that seen after the Great Depression itself. To be clear, as I have noted in previous writeups on this comparison, I’m certainly not contending that the level of human suffering during and after the Great Recession has been anywhere near what it was during the 1930s. 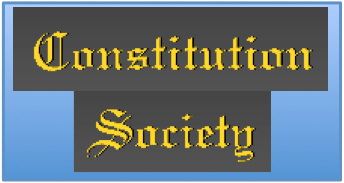 That said, many of us need to be reminded in this Obama-compliant media world — thank goodness we have the British tabloids to partially fill that void — that, among many other indicators of abject poverty and misery, there has been no meaningful decline in documented homelessness during the past several years. In early June, I characterized the Obama economy’s recovery during the first four years after the Great Recession’s official end as “awfully close” to being as ugly as that seen after the Great Depression. In late June, after the first quarter’s reported contraction worsened to an annualized 2.9 percent, the Obama economy’s margin narrowed even further. Nine quarters took a hit, three of them quite significant. 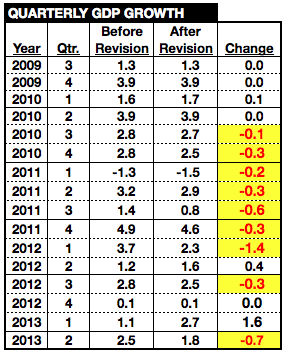 Only three got revised into an increase, and only one of them was significant. These revisions lengthened the amount of time it took for the economy to escape a recession under Warren Buffett’s definition. In September 2010, he told CNBC that he wouldn’t consider the recession to have ended “until real per capita GDP gets back to where it was before.” That statistic didn’t return to its fourth quarter 2007 peak until the third quarter of 2013, 23 agonizing quarters later. Before the revisions, the data showed that Buffett’s self-described “common sense” benchmark had been achieved in that year’s second quarter. 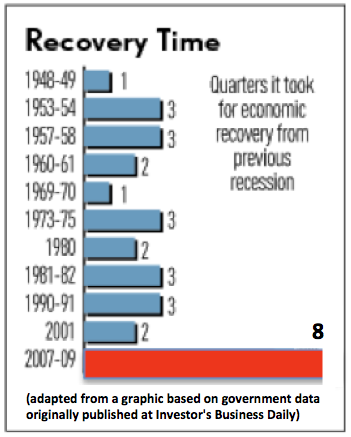 The revisions also changed how much larger than its pre-Great Recession peak the economy was after 16 quarters of “recovery” from the 4.6 percent seen at my June column to 4.1 percent. 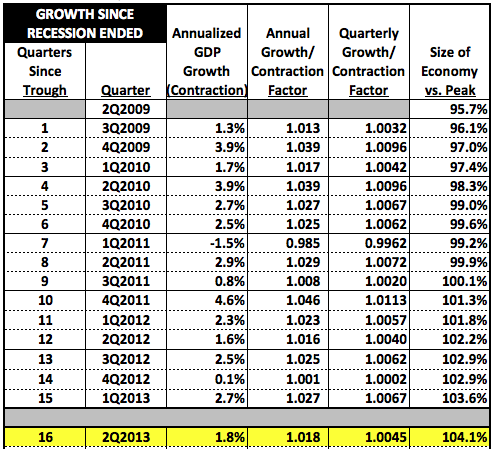 As seen above, and paraphrasing what I noted in June — In every other economic recovery (except in the Obama and Great Depression economies), GDP was at least 10 percent larger than its pre-downturn peak 16 quarters later (or fewer, in several instances when an earlier subsequent recession occurred). The Obama economy — often described by yours truly as the POR (Pelosi-Obama-Reid) economy to identify the three parties who bear primary responsibility for its pitiful results — has achieved less than half of that, and now comes in worse than the 1930s. As explained in June, this chart nukes the “deep hole” argument Team Obama tirelessly employs to explain away their pathetic economy. In reality, the deeper hole should have led to a stronger recovery. But it didn’t. In 1938, as it became obvious that Franklin Delano Roosevelt’s New Deal had failed to ignite a genuine, sustainable recovery, Treasury Secretary Henry Morgenthau Jr. lamented: “We have tried spending money. We are spending more than we have ever spent before and it does not work.” Clearly, it also didn’t work after the Great Recession. But now we have administration apparatchiks and President Obama himself howling with joy after one quarter has come in initially strong. They would be well-aThe Depression-Era 1930s—1, The Obama ‘Recovery’—Ødvised to curb their enthusiasm. The first quarter’s initial reading of 0.1 percent got knocked down by over 2 percentage points by the time all the dust had settled. More importantly, it would take about five straight years of 4 percent growth to get us even into the neighborhood of truly recovering what misguided fiscal and monetary policies have lost. 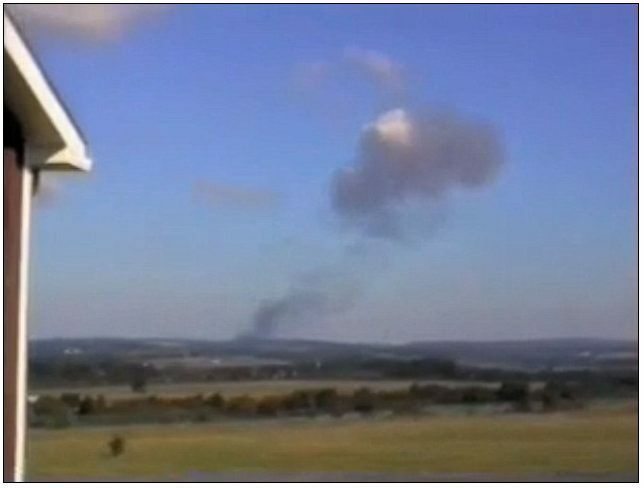 Does anyone see that happening? - Even if one factored in the last 4 quarters’ worth of 2.4% real GDP increase, the 5-year +6.6% peak-to-peak/+11.4% trough-to-peak recovery from the Great Recession is weaker than every post-WWII 4-year and 5-year recovery. 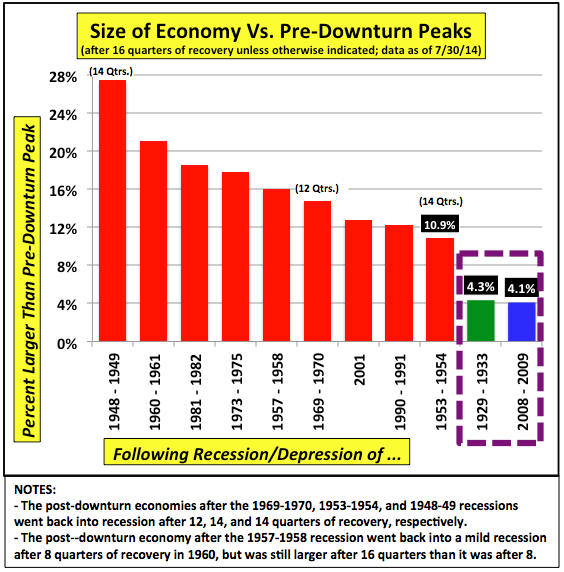 Amendment to the last statement – the +11.4% 5-year trough-to-peak recovery from the Great Recession is greater than the +9.7% 4-year trough-to-16th-quarter recovery/recession from the 1953-54 recession. However, at the 5-year mark following the 1953-54 recession, GDP was 14.8% greater than it was in the trough of that recession. I really shouldn’t do this late at night – the correct trough-to-20th-quarter growth following the 1953-54 recession is +17.8%. I thought about going 16 quarters with all, but thought that showing genuine recoveries until they ended would be more relevant. Thanks for the info.